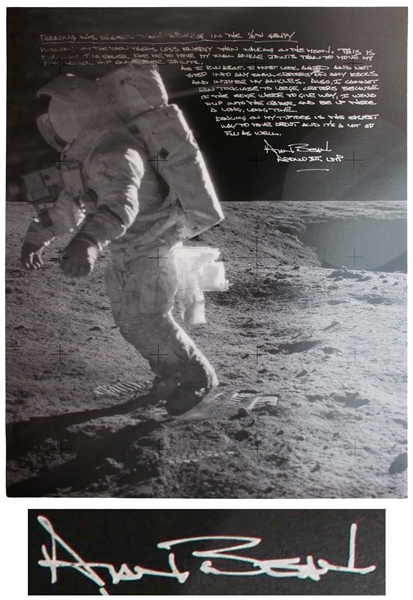 Alan Bean signed 16'' x 20'' lunar photo, with a vivid handwritten description by Bean of what it was like to walk and run on the moon, as well as the unexpected dangers lying in wait for the astronauts. Complete text of Bean's inscription reads, ''Running Was Easier Than Walking in the 1/6th Gravity / Running on the moon takes less energy than walking on the moon. This is because it is easier for me to move my small ankle joints than to move my much larger hip and knee joints. As I run about, I must look ahead and not step into any small craters or on any rocks and injure my ankles. Also, I cannot run too close to large craters because if the edge were to give way, I would slip into the crater and be up there a long, long time. Dancing on my tiptoes is the easiest way to move about and it's a lot fun as well. Alan Bean / Apollo XII LMP [Lunar Module Pilot]''. Semi-matte photo measures 16'' x 20''. Some minimal smudging on inscription, otherwise near fine.